Cured, which offers incredible house-made charcuterie, is located right in front of the Pearl Farmers’ Market. New farming policies are giving chefs access to amazing local produce. I'm from Texas, so I spent much of my childhood traveling my home turf, learning to appreciate the pho scene in Houston, the breakfast taco trucks in Austin and the contemporary Mexican spots of Dallas. The one city conspicuously absent from my family's road trip itineraries? San Antonio. Though it’s the second-most-populous city in the state, it’s long had the reputation among Texans as the runt of the litter, dining-wise. But about a month ago, I found myself there for a conference, and I learned how much had changed since my early years: Today, San Antonio is one of America’s more exciting up-and-coming dining cities. It happened that I visited at just the right moment. The city's restaurant scene has experienced a transformation over the past year or so—a place that once housed mostly Tex-Mex and chain restaurants is now home to a wide range of new spots serving vibrant dishes made with Texas produce. Some of this change is due to forces not unique to San Antonio—cities across the country are upgrading their dining scenes—but here there’s been an additional trigger: a series of changes in farming policy that has just taken effect. San Antonio contains some of the country's most fertile land for growing crops, but back in the ’80s, the state government pushed for pesticide programs that ended up wiping out a lot of the area’s arable land. Now, the Texas Department of Agriculture is investing in organic farming. Plus, the City Council recently changed its policies to officially permit local urban gardeners to grow and sell their produce on a large scale—giving them access to chefs and restaurants (before, the law was worded so that urban farmers weren’t sure if it was legal for them to sell). Now, farmers markets and co-ops for food producers have started dotting the city, feeding a dining scene that combines a Southern culinary bent with the newfound bounty of local foods. 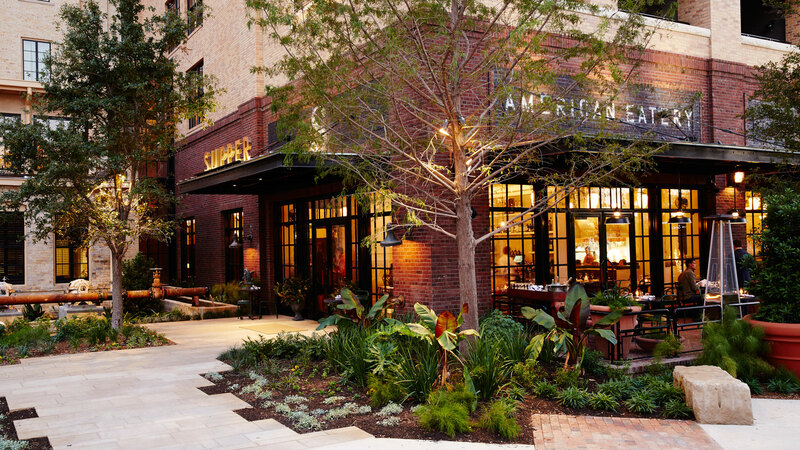 "San Antonio has become this incredible region for growing produce, and there is respectability and accountability coming through from the farmers," says John Brand, the chef at Supper. "Unlike nine years ago, where you could get something great for three to four weeks, and then it was gone, now the products are coming in on a more consistent basis." Brand's restaurant, Supper, was one of the first stops on my trip—and the perfect embodiment of the farming evolution that has taken place in the city. His place was one of the first to challenge the meat-centric model so deeply entrenched in Texas restaurant culture, putting veggies at the center of the plate. His bright dishes include salt and vinegar brussels sprouts, swiss chard spaetzle and smoked cauliflower with crispy quinoa. One of the most nationally well-known spots in San Antonio, Cured, has also been an early leader in the local food movement. The restaurant is located right in front of The Pearl Farmers' Market, which, according to chef Steve McHugh, has become a resource not only for him, but for his guests as well: "The farmers' market has become a gathering place," he says. "My customers are developing relationships with farmers just as I am." The growing accessibility of artisan foods has been crucial to Cured's concept, which focuses on cured meats, with everything made from scratch—from the pickles to the mustards to the pork rillettes. The charcuterie board was, hands down, the best one I had ever had. Glimpse the menu at Alchemy in the Five Points neighborhood, and you might think you were in Los Angeles—what with the lengthy kombucha menu and abounding vegan options (red curry mixed with buckwheat groats, pozole verde). The pork shank is made with a heritage breed from a sixth generation farm outside of the city, Peaceful Pork; and on top of the kombucha, the restaurant is experimenting with other forms of fermented foods—like the garlic in its charred and cured cauliflower. The Japanese spot, Kimura, is taking advantage of the city's abundant herb and vegetable selection for its noodle soups. The restaurant serves comforting bowls of ramen that combine bright, locally sourced elements like spring onions, marinated mushrooms, and bean sprouts with deeply flavored house-made broths. The weather in San Antonio may not be quite as cold as the East Coast, but the hot noodle bowls are as comforting as what you'll find at the best ramen-yas in New York. This approach has even seeped into the coffee shops and the bakeries. The place I frequented the most during my trip was Local Coffee, a San Antonio-exclusive coffee chain with its own roasting facility in the city, serving slow-pour brews alongside raw milk yogurt. And Bakery Lorraine right across the street should be your go-to for sweet treats. The owners, Jeremy Mandrell and Anne Ng, worked at Bouchon Bakery in Napa Valley, bringing Thomas Keller's signature precision and care for ingredients to their glossy canelés and lavender-scented shortbread. I sadly didn’t even get a chance to hit Mixtli, the experimental Mexican spot whose exciting tasting menus are inspired by ancient pre-Hispanic traditions—nixtamalizing corn for masa, roasting cacao beans for chocolate. The spot’s tasting menues earned its chefs, Diego Galicia and Rico Torres, a place in Food & Wine’s 2017 class of Best New Chefs.